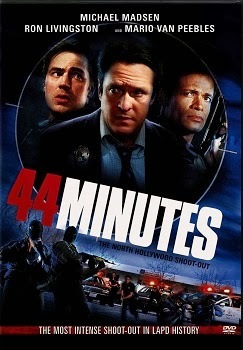 44 Minutes" is a Made for TV dramatization of the February 28, 1997 shootout between the LAPD and two heavily armed bank robbers. The event was shown on live TV. There have been a number of specials concerning the shootout on the Discovery Channel, Court TV and A&E. Being a true crime buff, I was looking forward to this DVD. Wish I had better things to say about the movie. The yardstick by which I judge all made for TV true-life crime dramas is the amazing "In the Line of Duty: The F.B.I. Murders." That film gives the viewing great insight into the crime spree, the police methods used to track the robbers, great acting and an amazing climactic shootout. That is a movie that needs to be released on DVD. While "44 Minutes" recreates many of the events of that fateful day, the film has no real depth. The main characters are cardboard. The badguys have all of the depth of a video game villain from "Grand Theft Auto." The only real attempt at character development goes into Mario Van Peebles as office Henry Jones. Jones is shown as a cop who wants to make a difference. Michael Madsen walks through the film as if he is waiting for the check to clear. Ron Livingston plays SWAT officer Donnie Anderson, the cop who took down the second badguy. "44 Minutes" may be worth a rental for true crime fans. They will probably be disappointed. Indiscriminate teens who like the sound of AK-47s may enjoy this. Otherwise beware. I hate to write these words as this was a shining moment for the LAPD. The only folks who died were the badguys. Though outgunned, the cops withstood a withering barrage and didn't back down. Lame movie. Nice sound and image transfer even though the images are uninspired. So-so extras. The transfer is fine. There are no artifacts, delineation problems or pixilation. The problems are due to uninspired photography. The filmmakers did a good job or recreating the actual shootout. The rest of the film is told through psuedo-documentary style interviews. The deliberately grainy video on the interviews detracts from the film. It is also a poor way to fill up the rest of the running time. Very good sound track. Once the bullets start flying you'll duck for cover. The track makes great use of the surroundsound feature of your home theater system. There is a behind the scenes featurette. Nothing special. It includes interviews with the cast and crew. There are also trailers for this movie and "The French Connection I & II." There is a dearth of material out there about the real event. Too bad Fox didn't include any of that as extras. It might have made this DVD worth buying. Worth a rent for action fans. Nothing inspired. Will somebody please release "In the Line of Duty: The F.B.I. Murders" on DVD!